AV deal: Get Dolby Atmos speakers for just $79 per pair | What Hi-Fi? If you have an AV receiver that is compatible with Dolby Atmos, and are contemplating taking modest steps to expand your surround sound speaker set-up to make the most of it, we have the deal for you. You can now buy upward-firing Atmos speaker modules for as little as $79 per pair, thanks to a 68 per cent discount on Onkyo's SKH-410 modules at New Egg. The $89 sale listing can be reduced by a further $10 with the promo code '319UPGD38'. 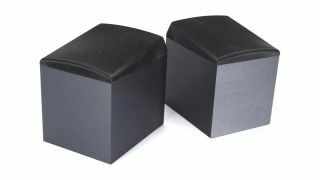 The SKH-410s are small speakers designed to be placed on top of existing surround sound speakers to fire a Dolby Atmos soundtrack's height channels upwards to create a sense of overhead sound. Such dedicated speaker modules have become increasingly popular in recent years as more affordable and practical alternatives to in-ceiling speaker Atmos installations. In a 5.1 speaker set-up, adding one pair of SKH-410s on top of your front right and left speakers would create a 5.2.1 system, while a second pair atop the back right and left speakers would create an even more immersive 5.4.1 configuration. These Onkyos feature 8cm cone drivers, wooden cabinets with a black finish, and cloth grilles, and included is a pair of 3m speaker cables. As we haven't been twelve rounds with them in our test rooms, we can't wholly vouch for their performance as we can pricier alternatives such as the KEF Q50a ($500). But for $79, they may well be worth taking a punt on for those on strict budget.